The lost city of Niyna in the Taklamakan Desert is located roughly 115 km north of modern-day Niya, in China’s Uygur Autonomous Region. In ancient times, it was named Cadota in its native language and Jingjué in Chinese. Located on the southern branch of the Silk Road, Niya (Cadota) was once upon a time a thriving oasis city and commercial center. By the third century, it was a part of the Loulan Kingdom, and towards the end of the fourth century it was under Chinese suzerainty. Later, it was conquered by Tibet. Sprawling over an area of 20 km in circumference, the city is believed to have been at its largest between circa 500 and 1,000 AD. Eventually, the city declined and became buried by the desert. It wasn’t discovered again by archaeologists until the early 1900s. Some artefacts from the city has been moved to museums and collections in other parts of the world, such as the British Library and the British Museum in London, UK, the Tokyo National Museum in Japan, and The National Museum in New Dehli, India. At the British Museum, artefacts are included in the Aurel Stein collection. 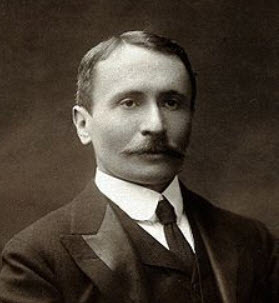 In the early 20th century, the Hungarian-born Britihs archaeologist Aurel Stein headed four expeditions that carried out excavations at old Niyna. Several groups of dwellings were excavated, and a hundred wooden tablets written in 105 AD were discovered. The tablets were written in Kharoshthi, and early Indic script. A joint China-Japan archaeological excavation project was approved by China’s State Bureau of Cultural Relics in 1993. During the excavations in the 1990s, the joint China-Japan project unearthed eight tombs with intact bodies wearing the remains of colorful garnments. All eight tombs were located at the northern section of the old city. The bodies had been placed in hollowed out logs or wooden trunks, with an outer coffin. The dry climate of the desert, and the fact that the city was abandoned, has helped preserve the tombs and the bodies, their clothing and their burial articles. 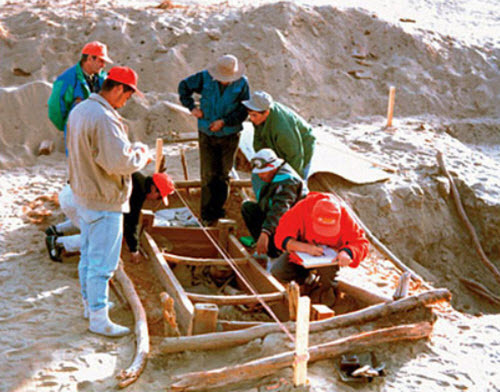 In the 1990s, the bodies and their artefacts were transported to the city of Ürümqi, since the archaeological site lack sufficient facilitites to do a proper investigation. Tomb number three contained two bodies, one female and one male, but they were not burried at the same time. Both of them were dressed in fancy silk hoods, colorful robes, trousers, shirts, and embroidered shoes with leather soles. The silk was of very high quality and was still lustrious when the archaeologists found it. Even the colors green and yellow, which are known to fade easily, were strong and well-preserved. The man had been buried with a bow and a quiver, metal arrowheads, and a lined Chinese jacket. The woman had been buried with a lacquer box containing a comb, a sewing kit, and makeup. She wore gold earrings and a necklace made from glass-beads.